Belting products are available in multiple widths and styles. Most of the heavy weight fabrics are heavily coated with PTFE to ensure consistent and reliable release performance in applications as diverse as polymer casting, lamination, composite manufacturing, rubber curing and vulcanization, and general conveying. Several products are available with a light PTFE coating that allows for offgassing through the belt where required. 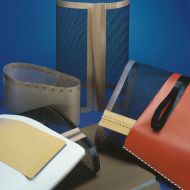 There are a huge range of materials that can be used to construct the belt including coated fabrics, CHEMLAM® laminated products, KEVLAR®, open mesh and anti-static. We can tailor the belt construction and joint to your needs. A reinforcement strip along the belt edge can protect the belt from ripping. Sometimes it is not possible to edge a belt due to the application, packaging for example. Endless belts can be made that have no increase in belt thickness at the joint. This is crucial in some packaging applications. A flap can be provided to prevent your product falling through the belt joint.